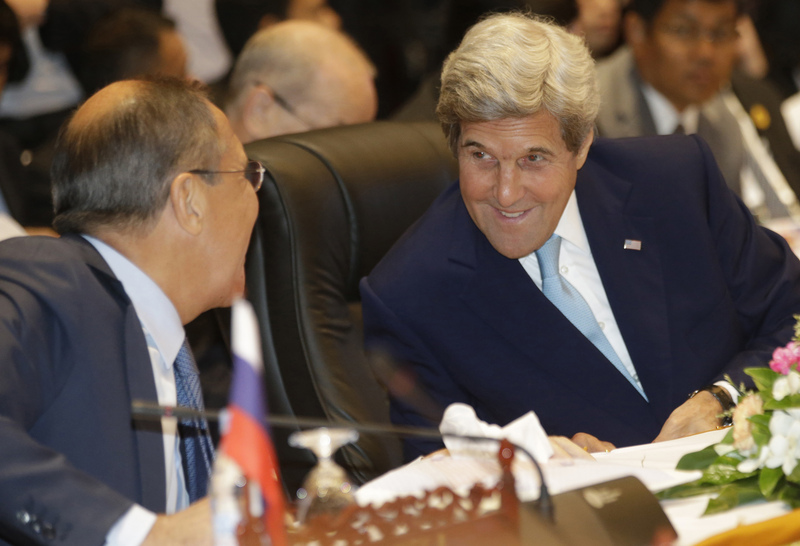 VIENTIANE --Secretary of State John Kerry says he raised the email hack of the Democratic National Committee with Russia's top diplomat but stopped short of making any allegation about who might be responsible. Kerry told reporters Tuesday he brought the matter up with Russian Foreign Minister Sergey Lavrov at a meeting in Laos and explained that the FBI was investigating. He did not, however, repeat allegations or echo suspicions that Russia was responsible for the hack and said he would not draw conclusions until the probe is complete. "I raised the question and we will continue to work to see precisely what those facts are," Kerry said. He would not say if Lavrov responded. Asked about the allegations earlier, Lavrov scoffed, saying: "I don't want to use 4-letter words." How did Republicans react to Hillary Clinton's convention speech? Fallen soldier's dad to Trump: "You have sacrificed nothing"
The FBI confirmed Monday that it was investigating the hack involving Democratic National Committee (DNC) emails. A cache of more than 19,000 emails from Democratic party officials, were leaked Friday in advance of Hillary Clinton's nomination at the party's convention this week in Philadelphia, and they detail the acrimonious split between the Democratic National Committee and Clinton's former rival, Sen. Bernie Sanders, D-Vermont. Although Wikileaks' posting of the emails Friday did not disclose the identity of who provided the private material, those knowledgeable about the breach said last month that Russian hackers had penetrated the DNC computer system. At the time, DNC Chairwoman Debbie Wasserman Schultz said the breach was a "serious incident" and a private contractor hired to sweep the organization's network had "moved as quickly as possible to kick out the intruders and secure our network." The Hillary Clinton campaign has blamed the email leaks on Russia, reports CBS News' Julianna Goldman. Clinton's campaign manager Robbie Mook accused Russian President Vladimir Putin of meddling in the U.S. election. "What the experts said when this breach initially happened at the DNC was that they believed that it was Russian state actors who took these emails," Mook said. "Russian state actors were feeding the emails to hackers for the purpose of helping Donald Trump," he continued. But neither the Clinton campaign, the White House, nor lawmakers briefed on the hack definitively linked the leak to the Russian government on Monday.